This file contains each individual ship-based observation, including characteristics of Primary, Secondary and Tertiary ice types and snow cover. This file contains a sub-set of the full data archive. Observations less than 6 nautical miles from the previous observation have been removed. This file contains summary statistics, including mean ice and snow thickness, for a subset of the full data archive. Observations less than 6 nautical miles from the previous observation have been removed. A full description of the data quality control and processing can be found in Worby et al (2008). Worby, A. P., C. Geiger, M. J. Paget, M. van Woert, S. F Ackley, T. DeLiberty, (2008). Thickness distribution of Antarctic sea ice. J. Geophys. Res., 113, C05S92, doi:10.1029/2007JC004254. 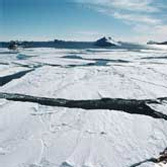 The Australian Antarctic Data Centre now archives in situ data on Antarctic sea ice and snow cover properties. This includes data from thickness transects across ice floes, snow pits and ice cores. Data from Australian, Japanese, German and US expeditions are currently available. Data can also be contributed online using the excel proforma available from the site.